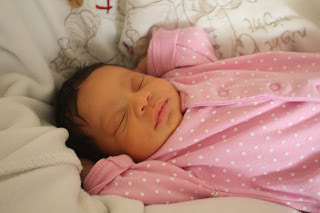 7 days ago, I unexpectedly gave birth to a little girl (about 3 weeks before she was due). What followed was nothing short of a 7 day emotional roller coaster that has left me so very drained (physically and mentally) yet at the same time so very grateful for my blessings. And I am blessed. I have been blessed. I continue to be blessed. I want to thank everyone who participated in the prayer chain, who interceded on our baby's behalf. Thank you so much for your support - may what you have given return to you sevenfold. I am now a mother of three whole and healthy children. I am blessed, and I give thanks. She is soo beautiful! Congrats on your new addition and even though the path was rough I am so glad that God and his Angels saw you through. Congrats, she is beautiful! Glad to know that all is well. Congratulations on the birth of your daughter! She is beautiful and healthy and thats what counts!!! Stay blessed! CONGRATS lady!!! She is beautiful like her mom! congratulations on your beautiful, healthy girl!!!!! Congrats! From one mother of three to another, I wish you many, many, blessings! Thank God for her safe arrival and I hope your recovery goes smooth. Take care! She is so precious! Children are truly a gift from God! Congrats to you and yours...!! I knew she would be okay because I know her mother! And her mother is one strong, sisterly, gracious, amazing, praying woman. She is gorgeous (as expected! )- you make beautiful babies! OMG she is sooooo beautiful! Congrats, I am so happy to hear she is doing alright, and hope you have a speedy recovery! After all of that, you got the greatest gift ever. She is lovely! May you both be blessed with health and happiness. Heartfelt thanks to each and every one of you. Your kind words are very much appreciated.